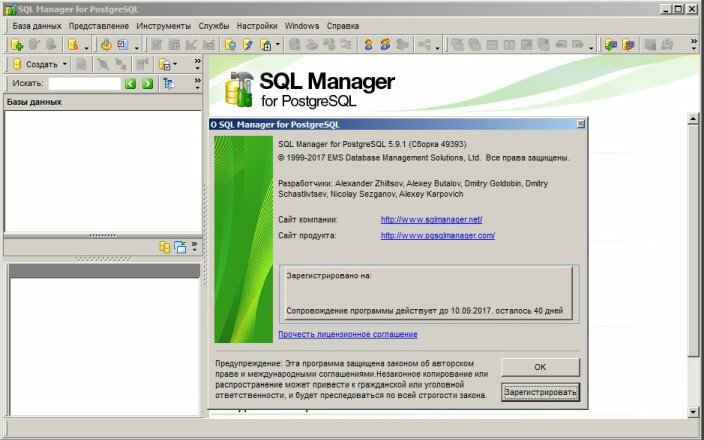 EMS SQL Manager for PostgreSQL работает со всеми версиями PostgreSQL и поддерживает все самые новые возможности PostgreSQL, включая поддержку ограничений исключений, условия when для триггеров, функции, возвращающие таблицы и другие. PgManager включает в себя множество инструментов, таких как Визуальный конструктор баз данных, который позволяет быстро создавать базы данных PostgreSQL, Визуальный конструктор запросов для построения сложных запросов к PostgreSQL, мощный редактор BLOB и многие другие полезные инструменты для эффективного администрирования PostgreSQL. Современный, графический интерфейс и оптимальная система мастеров настроек будут понятны даже новичку. EMS SQL Manager for PostgreSQL is a high performance tool for PostgreSQL database administration and development. It works with any PostgreSQL versions up to the newest one and supports the latest PostgreSQL features including exclusion constrains, ‘when’ clause of triggers, functions returning table, and others. SQL Manager for PostgreSQL full offers plenty of powerful database tools such as Visual Database Designer to create PostgreSQL database in few clicks, Visual Query Builder to build complicated PostgreSQL queries, powerful BLOB editor and many more useful features for efficient PostgreSQL administration. PgManager has a state-of-the-art graphical user interface with well-described wizard system, so clear in use that even a newbie will not be confused with it PgManager. - Support for PostgreSQL 10 has been added. - Added support for partitioned tables. - The Debugger has been considerably improved. - Debugging with pldbgapi extension is possible now. - Improvements in Compare databases wizard. - Function editor windows with long names are restored correctly now. - In some cases passwords from pgpass.conf were not used. Fixed now. - Commit and Rollback buttons are not shown now if no changes were made. - SQL Editor. Execution of the query will continue on error, if "Show result for each query" is enabled. - Form view. NOT NULL attribute was not available for BOOLEAN type. Fixed now. - Function editor. The shortcut for debugging changed to Ctrl+D now. - Many other fixes and improvements. Added GENERATED AS IDENTITY property for fields. Import failed in "Update or Insert" mode, if all columns were selected as keys. Fixed now. Fixes and improvements in the Debugger. User list is now exported to the correct folder. Privilegies are restored correctly on recreating the field now. Support of partition options has been implmented in the Extract database wizard. Cast operator ( :: ) can be used with parameter symbol ( : ) correctly. Text with quotes and backslashes is imported correctly now. Functions with domain-based parameters were not displayed in Search metadata results. Fixed now. Export of TO-DO list has been implemented. Trailing spaces were trimmed on copying records in the grid. Fixed now. Support for backup and restore of 10.4 и 11.0 server versions has been added. Compare databases. Support for partitioned tables implemented. Compare databases. NEXT_VALUE is not synchronized for sequences by default. Owner info is now displayed on the DDL tab. REFERENCING option is now supported in triggers. Some errors in the debugger have been fixed. Minor improvements in SQL Editor highlighting. Many other improvements and bug-fixes. Добавлена поддержка резервных копий БД для сервера версии 11.1. В редактор функций добавлена опции PARALLEL. В редактор поля добавлена возможность просмотра и изменения метода хранения данных. Улучшена работа проверки синтаксиса в редакторе функций. Для некоторых пользовательских типов данных в редакторе функции не отображалось название типа. Исправлено. Вложенные многострочные комментарии теперь распознаются корректно. План запроса мог не возвращать данные, если после EXPLAIN не было пробела. Исправлено. При импорте данных при несовпадении кодировок могла прерваться транзакция. Исправлено. Исправлена ошибка генерации скрипта на смену владельца для материализованных представлений. Тип данных BIT VARYING без уточнения размера теперь корректно отображается в фрейме данных. Added support for 11.1 version backup. PARALLEL option added to functions. Storage method is now displayed for fields. Improved syntax check in functions. Type name was not displayed for some user data types in functions. Fixed now. Minor fixes in the Save settings wizard. Nested multiline comments are now recognized correctly. Query plan didn’t return any data if no space was set after EXPLAIN. Fixed now. Transaction was sometimes aborted on importing data if database and client charset was different. Fixed now. Statements for OWNER change in materialized view were generated incorrectly. Fixed now. BIT VARYING data with unlimited size is now displayed correctly in data frame.